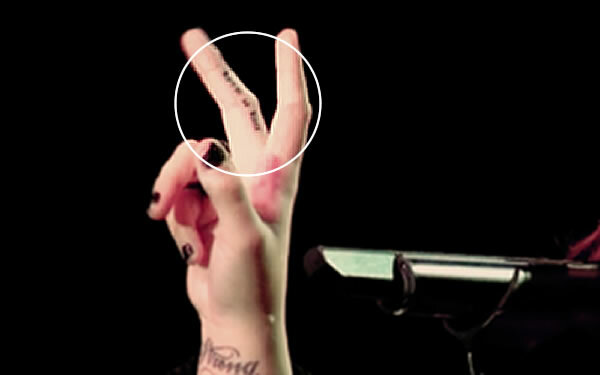 Demi Lovato got her “rock n’ roll” tattoo on her finger in late 2011, and the ink accompanies the small peace tat she has on another finger. Demi’s rock n’ roll tattoo matches a tat her best friend Hanna Beth has inked on her right hand, and the two girls also having matching tattoos of pouty red lips. 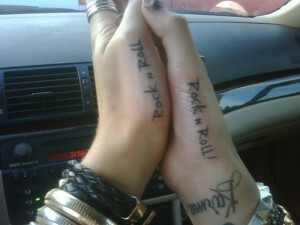 Curious why Demi Lovato and her friend chose to get this particular tattoo? Read on to learn more about the young singer’s rock n’ roll tattoo and what meaning it holds for her. 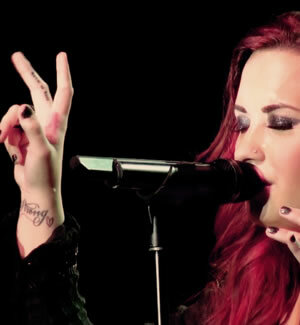 We think Demi’s rock n’ roll tattoo speaks for itself. With her affinity for all-black outfits and her growing collection of tats, the singer is clearly trying to establish herself as an all-out rock star. She may actually be following in the footsteps of idol, Rihanna, who has quite a few tats of her own and is known for her bad-girl attitude. In fact, during a radio interview, Demi admitted that when she is bored she loves to throw things and even revealed her tendency to randomly trash dressing rooms. “I break things,” she reportedly said. “I’ve trashed dressing rooms just for the hell of it.” Demi continues, “I’ve done some pretty rock and roll things that I probably shouldn’t talk about.” Is it just us or does that sound more like teenage immaturity than rock and roll antics? Ah well, to each his own. Having shot to fame as a young, wholesome Disney star, Demi Lovato shocked everyone by suddenly checking into rehab in November 2010. Since she finished treatment three months later, the young singer has continued to struggle with the bulimia and cutting issues that she has harbored since she was 12 and 13. “Now I can eat as many meals as I am supposed to and not throw up anymore,” Demi says. “There’s definitely temptation – every meal I fight it. It’s an addiction and I’m going to have to fight it for the rest of my life.” You’d think she would do so more successfully by cultivating a lifestyle that was calm and stress-free. But instead, she has embraced her “rock star” side, covering her body in tattoos and relishing in behavior that she sees as “rock and roll.” She’s still young, after all! Why does her getting tattoos have to be negative? Pretty biased and an old fashioned way of thinking. Lots of people get tattooed and good people can have a lot of tattoos. By the way she is definitely NOT covered in tattoos-she’s got a few little ones. Isn’t this a website based on tattoos? So why put getting them in a negative light like that?